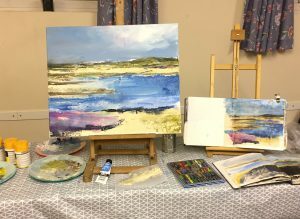 Looking forward to giving an art demonstration for the Wymondham Art Society on Wednesday 3rd April at the Roman Catholic Church Hall, Norwich Rd, Wymondham, Norfolk, NR18 0QE at 7.15pm. The hall is a separate building next to the R.C. church with ample parking. During the demonstration I’ll explain my process, how I explore mixed media and the materials I enjoy using when creating my artworks. Small entrance fee. Refreshments. All welcome.